How many times have you heard a recall and thought, “I’m pretty sure I don’t have that in my house.” THIS nationwide recall might be completely different! You might have this in your pantry, or put it in your child’s lunchbox TODAY! A nationwide recall is underway for certain Chewy Chips Ahoy cookies. This voluntary recall is due to the concern that the cookies may contain an “unexpected solidified ingredient”. It’s unclear what that may be, although CNN reported it could be corn starch, which could produce adverse health effects. You are asked to throw away the product, or return it to the store. 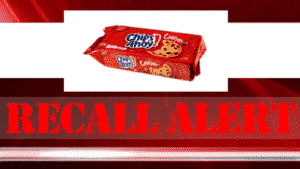 The recall includes 13-ounce packages of Chips Ahoy Chewy cookies with “best when used by” dates of September 7th and 8th, 14th and 15th 2019.